Beginning with a two week training of fifty-two community leaders in 2005 in AOD led by a mission team from St. Barnabas Church in New Jersey, the SARAH Network drew the attention of the US State Department who awarded a three-year grant through the USAID PEPFAR/NPI for ADA/HIV/AIDS prevention. Since 2010, GOAL has worked with a variety of community-based leaders trained under the grant to continue AOD community awareness, planting recovery support groups, such as AA and training clergy. After the demise of the grant, these leaders, with GOAL’s guidance, formed and registered a new Kenya-based organization called the USAWA_GOAL Network. GOAL responded to a request from the Anglican Diocese in South Maseno to train their clergy and lay leaders by connecting them to the Kenya leaders trained under the grant to be the trainers for their Synod clergy and lay leaders, also to provide them with literature and resources in addiction recovery and prevention awareness. In 2013 Terry Webb donated her Tree of Life book as a resource for USAWA_GOAL members to use for training. 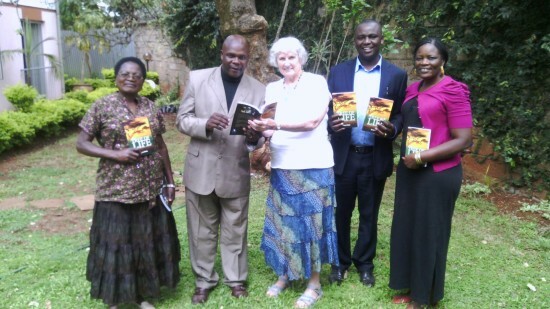 She met with the leaders in 2014 to officially launch the book.